New Larger Bottle! Photos Coming Soon! 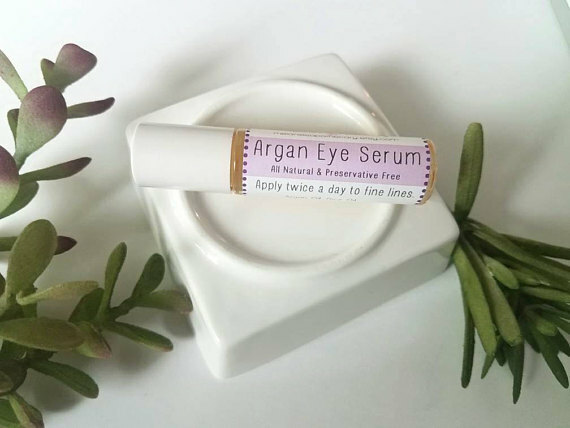 Apply this argan eye serum after washing your face to help smooth out lines and tighten your skin in a natural and safe way. The natural oils that I use in this blend are known to help tighten your skin while keeping it moisturized. I would recommend applying this two times a day, in the morning and at night. This oil comes in a small roll-on bottle. A little bit goes a very long way with this oil! Please give the bottle a gentle shake before use to re-blend the oils. As with all new products you use, try it on a small area first to make sure you do not have any allergies to the oils. I do not use preservatives in this serum.